As you know we love breakfast for dinner. 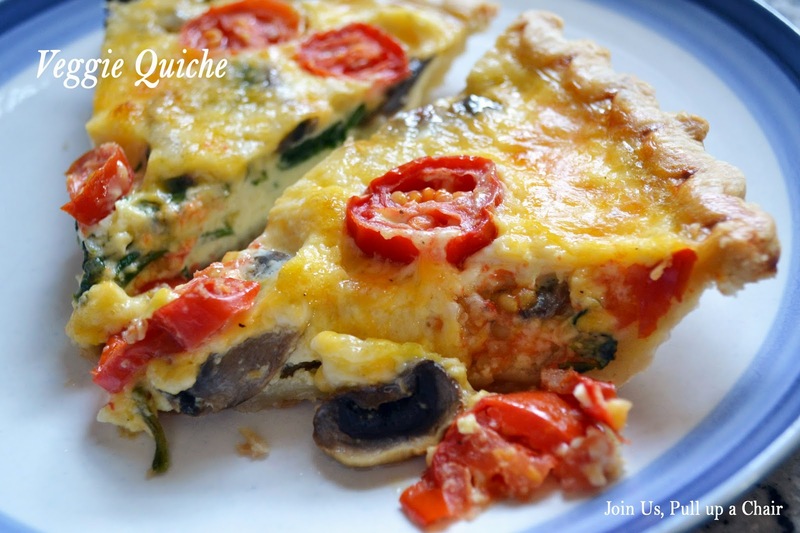 I had two frozen pie crusts and eggs that I needed to use, so quiche was the perfect solution. I made one with vegetables and the other with ham and cheese. I knew the kids would eat the ham and cheese one with no problem, but I wanted one with veggies. I used what was in the fridge, but you could use whatever your have laying around. They’re easy to reheat and could be frozen too. Preheat oven to 400 degrees. In a medium bowl, mix together the milk and eggs. Season with salt and pepper. In the bottom of the pie crust, spread a layer of cheese and the vegetables (except tomatoes). I precooked the mushrooms and spinach before adding them to the quiche. Pour the egg-milk mixture slowly over the vegetables and then add the halved cherry tomatoes over the top. Bake for 35 to 40 minutes or until the eggs have set.